Tossa de Mar is a charming and picturesque beach resort on the Costa Brava coast of Spain. Not as big or busy as neighbouring Lloret de Mar, there is however much to see and do and below we guide you to the best spots in the town in our tourist information guide. The nearest airport to Tossa de Mar is at Girona (Gerona, airport code GRO) which is 41km away and used by many charter and budget airlines as well as schedules airlines. The transfer time by car or bus is about 43 minutes. The next closest airport to Tossa de Mar is Barcelona international airport (airport code BCN) which is 103km away with a transfer time of 1 hour and 34 minutes. A last resort option is perhaps Reus airport where low-cost airlines like Ryanair fly to. This is however 200km and a 2 hour 12 minute drive away. If you fly into Girona then you can always get a shared shuttle bus transfer with ShuttleDirect for just £8 per person one-way or pay £22 for a private shuttle transfer per person one way with a personal driver and door-to-door service. Alternatively there is a public bus service operated by the Sagales company from the airport to towns and resorts up and down the Costa Brava. Hiring a car makes a lot of sense if you plan on taking excursions and day trips around the Costa Brava. A weeks car hire is £80 for a mini-sized car. It probably makes sense to hire a economy-sized car for just a little more (£85) or even a compact for £95. You will get more leg room and the ability to definitely get all your luggage in if there are four of you. The co-ordines for satellite navigation are 41°43′14″N 2°55′56″E. Tossa de Mar is located in the Spanish community of Catalonia, the province of Girona and comarca of La Selva. For mid-range accommodation try the 3-star Park Hotel on C/ Giverola, 4. Tel. 972 342 222 – Fax 972 340 565. Of course most people visit Tossa de Mar for the beaches but what if you want to explore the town and understand it’s history – what is there to see and do? Head for the ancient medieval walled town quarter of Vila Vela on the headland overlooking the town and main beach. This landmark cannot be missed and provides some great photo opportunities. Indeed this area was location for the film Pandora and the Flying Dutchman starring James Mason and Ava Gardner in 1959. A statue of Ava Gardner can be found in the town. The fortified battlements and towers were built during the 12th century to defend the town from pirates. Now the narrow cobbled streets house souvenir shops, cafes and restaurants. The former governor’s house dates back to the 14th century and is now a museum with relics dating back to prehistoric times to the Middle Ages. You can also see the famous painting by Marc Chagall entitled ‘The Celestial Violinist’. There are 14km of wonderful sandy beaches and coves. The main horseshoe shaped beach of Playa Gran has golden sand that slopes gently into the clear waters of the Mediterranean Sea. Playa Gran (also known as Platja Gran) has a gorgeous backdrop of the ancient castle. There are plenty of facilities and amenities such as toilets, showers and lifeguards on hand for any medical emergencies. Tossa de Mar has plenty of water sports based activities to cater for the active. You can sail, water-ski, windsurf or jet-ski. Alternatively take a boat trip on a glass-bottom boat. The coast is particularly popular for scuba-diving. Notably because of the small Medes islands which have clear visibility waters teeming with fish and other marine species. The beaches have plenty of bars, cafes and restaurants although it is worth noting that this isn’t the best resort if nightlife is important to you (nearby Lloret de Mar is best for that). 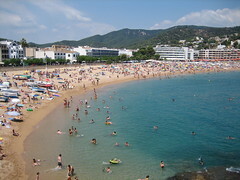 Other beaches include La Mar Menuda on the other side of the bay or El Codolar around the headland from the castle. If you fancy a bit of naturalism i.e. a nudist beach then the Playa de Vallpresona is the beach for you – take the main road from Tossa de Mar towards Sant Feliú de Guixols and turn off when you see the road marker for km 34.5. The Sa Riera Park is a nature reserve which protects the forest, river and lake. Tosse de Mar itself is set on a four mile protected stretch of coastline known as the Massif de Cadiretes full of varied terrain. Take a walk to the landmark lighthouse and go inside and take a tour. The views are amazing! You should be aware that the climate on the Costa Brava is much different to the Costa del Sol and Canary Islands of Spain. It does rain a lot in this region. Remember that the French border is only 100km to the north. In summer you won’t have a problem but if you are considering moving to Tossa de Mar and living here as an expat on a permanent basis, then you should factor this into your decision. You do however have the closeness of Barcelona and the mountains for skiing as advantages. 1. Trip to the scenic and historic city of Girona. 2. The small beach resort of Sitges is very artistic and bohemian with great festivals. 3. For another big beach resorts consider a day trip to bigger resort Lloret de Mar. 4. Go into the Pyrenees mountains and go skiing in Andorra. 5. A day trip to Barcelona (95km) is a must. 6. France is only 100km to the north. More info and map here on our tourist office page. We have a map below which will can be used in a variety of ways. Obviously it can be used as a road and street map – handy if you are trying to find your accommodation or how to get there from the airport – you can print off driving directions too. You can also zoom in and out or move in all directions so if you want to see what towns, resorts and attractions are near to Tossa de Mar, you can do that too – ideal for planning some excursions and days out. The alternative satellite/Google Earth view is also useful for seeing the resort from the air and seeing if your accommodation is built up or not as you can see exactly what surrounds it! Page Summary – This page contains unique content about the large beach resort of Tossa de Mar, a popular tourist destination on the Costa Brava coast of Spain.